Tracey McIntire earned her BA in English at Rivier College in Nashua, N.H. She was born in Concord, Mass. and grew up surrounded by Revolutionary War history, but became interested in the Civil War when she discovered 11 ancestors who fought for the Union. 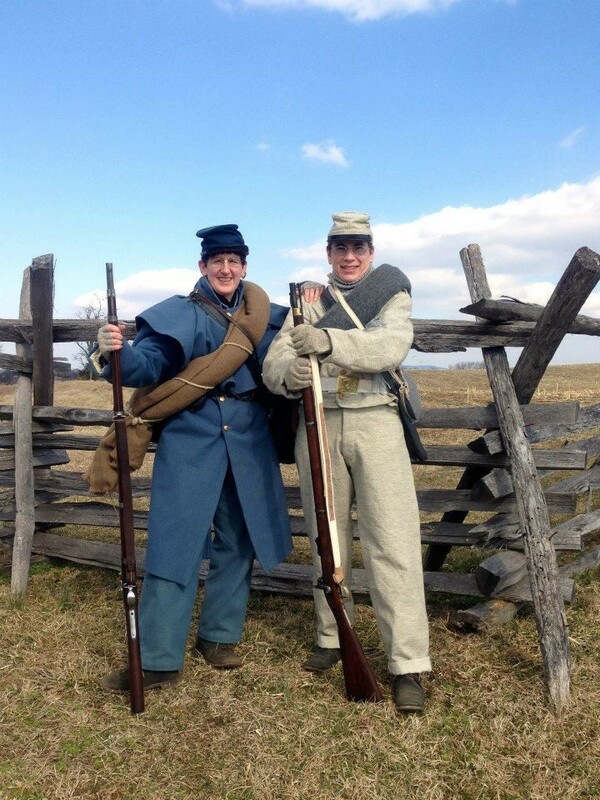 Tracey is a Battlefield Ambassador at Antietam National Battlefield where she also serves on the artillery and infantry detachments, is a certified master docent at the National Museum of Civil War Medicine, and an active Civil War living historian, where she portrays a woman soldier in various guises. She is also a paid Historical Interpreter at South Mountain State Battlefield where she serves on their cannon detachment. She is a member of the Company of Military Historians, Daughters of Union Veterans of the Civil War, and the Ladies of the Grand Army of the Republic. Tracey has worked for the Civil War Trust since November of 2009, a true dream job for her. Audrey Scanlan-Teller earned her MA and PhD in art history at the University of Delaware. She was a Samuel Kress Fellow at the Walters Art Museum and an exhibition advisor for the Washington County Museum of Fine Arts exhibition “Valley of the Shadow” which commemorated the 150th Anniversary of the Maryland and Gettysburg Campaigns in the Civil War. Her interest in the American Civil War was rekindled after moving to Frederick County, Maryland, and the discovery that her own Union relatives fought and died there. Since 2005, she has portrayed a Civil War enlisted soldier for historical interpretive demonstrations, a portrayal that compelled her to study the women soldiers of the Civil War. A published scholar and public speaker, Dr. Scanlan-Teller is a Master Docent at the National Museum of Civil War Medicine, an active interpretive volunteer at Antietam National Battlefield Park and South Mountain State Battlefield Park and a small business owner. On Wednesday, August 17th , Audrey Scanlan-Teller & Tracey McIntire will present their Summer Lecture Series talk on “Woman Soldiers in the Civil War”. There are hundreds of documented cases of women who fought disguised as men during the Civil War. Tracey and Audrey will discuss and share documentation of some of the more fascinating women and what motivated them to fight alongside men.